Last year’s event was so much fun, you knew it was coming back. That’s right, the 2nd Annual Big Kids LEGO Competition is happening tomorrow night! Twenty adult competitors will piece together their masterpiece best representing the theme, “Whistler’s Secrets” for the glory of reigning as Whistler’s master builder of this iconic children’s toy. 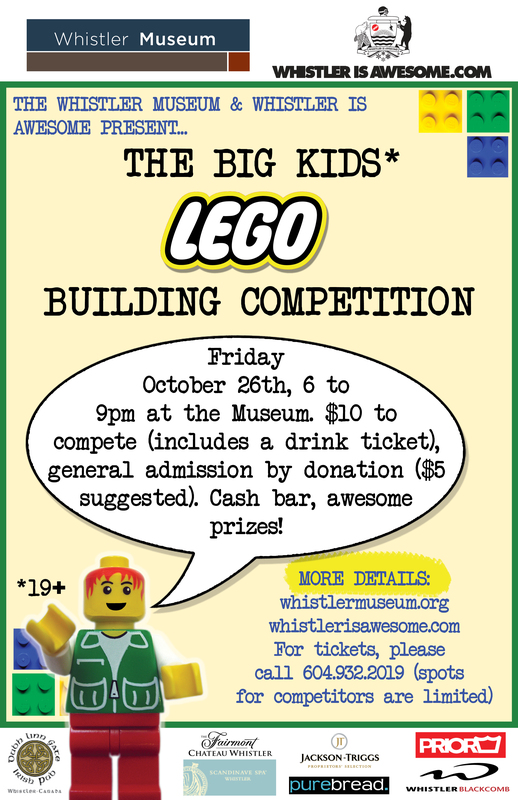 Interested LEGO competitors need to sign up through the Whistler Museum by by calling 604-932-2019. Entry to compete is $10 and includes one drink while spectators are welcome to join in the party and cast their votes for the winning submission for a suggested donation of $5. There will be a cash bar and everyone is welcome to mix, mingle and explore the Whistler Museum. For the less competitive big kids out there we will have plenty of spare LEGO set up for you to play with. Doors open to competitors at 6pm, and general admission starts qt 7pm. Big thanks to event partners Whistler Blackcomb, the Fairmont Chateau Whistler, Dubh Linn Gate Irish Pub,Scandinave Spa Whistler, Purebread Whistler and Prior Snowboards for donating some great door prizes as well as booty for first, second and third place.